Stay in touch with current University of California ANR research and extension activities. November has arrived, and before you know it we'll be ringing in 2018! For those who hold a license or certificate from the Department of Pesticide Regulation (DPR), and have a last name starting with the letter M through Z, this is your year to renew. DPR is urging license and certificate holders to mail in applications now to avoid late fees and to allow enough time for processing so that you can receive your new license or certificate by the beginning of the new year. Renewing early gives DPR time to notify you if you are short any continuing education (CE) hours and allows you time to complete any additional CE courses without having to retest. 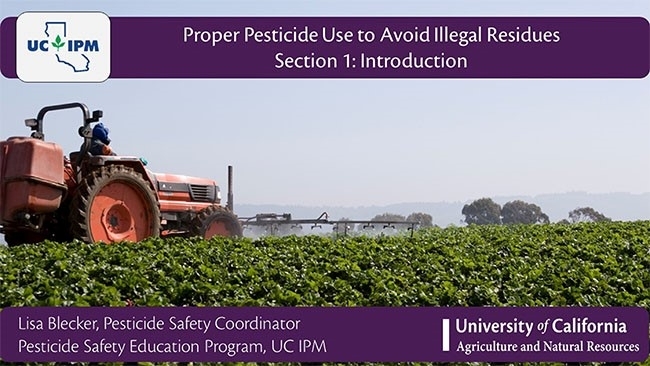 If you need more hours to complete your renewal application and don't have time to attend an in-person meeting, then check out the online courses available from the UC Statewide IPM Program (UC IPM). The following UC IPM and UC Agriculture and Natural Resources online courses have been approved by DPR and are available whenever and wherever you want to take them. For those of you with last names A through L (or those of you who want to get a jump on your CE hours), look for new online courses from UC IPM coming in early 2018. View the list of all DPR-approved online or in-person courses. For more information on the license and certification program and renewal information, visit the DPR website. For more information about pest management and other training opportunities, see the UC IPM website. Got Pests? Check out our online resource tool. Many thanks for the correction. Tammy Majcherek: Many thanks for the correction. Anne Schellman: Great post! Thanks for sharing.